It’s all about cheese in El Presidente’s latest venture . 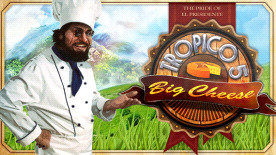 Create and promote an artisan cheese brand by introducing a new production chain with the Creamery: a new building that enables you to make the most of Tropico’s local goats and llamas. Face international competition in an epic quest to create the best cheese in the world and put on the chef’s hat! This add-on includes an all-new sandbox map and task, a standalone scenario, building, avatar accessory and music track!